My Two Blessings: My Nook is here!!!!!! I plugged it in to charge while we ate dinner, then started playing with all the features. First impressions - very easy to find a book and download. 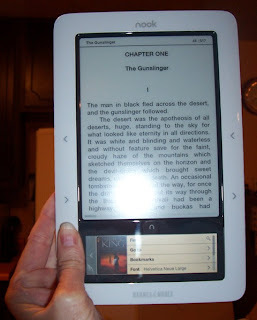 The bottom touch screen is easy to navigate and I went right to the shop and downloaded Stephen King's Gunslinger, book 1 in the Dark Tower series. I'll let you know more when I have more time to play. So very jealous! Mine is supposed to ship Friday (crossing fingers). Enjoy! I look forward to hearing now it works for you after you've had it awhile. I'm still debating Nook vs. Kindle vs. Neither. I think that Nook went to the wrong address!! LOL!! Enjoy it and let us know more! Congrats! This is fantastic news. Ooh, I like the look of that! Touch screens are so much more intuitive to use. ONG, I'm having serious envy issues. Wow.